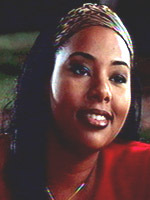 Mia will (sadly, methinks) forever be known for her role in the almost funny teen romp Road Trip from 2000. In it, she plays “Rhonda,” the love interest of the anti-hunk of the group, DJ Qualls. Sadly, she was cast in the role as a counterpart to the sickly thin Qualls due to her, how shall we put this? Plus-size stature.